Diabetes is a disease that affects 30.3 million people—roughly 7.2 million of which are undiagnosed. Your chance of developing type 2 diabetes is dependent upon a combination of factors related to both your genes and lifestyle. Though you cannot change your hereditary risk for this incurable disease, you can take a big step toward prevention by adjusting your lifestyle risk factors, such as eating and exercising habits. As we mentioned before, over 84.1 million adults in the U.S. have prediabetes, and 90% of these people are unaware that they are at risk. As wellness coaches and health experts driven by the goal of helping all individuals achieve their optimal wellness, we at Balanced Wellness strive to do all we can to address type 2 diabetes. Learn about our Prevent T2 Program here, and read on to learn about some of the risk factors. After turning 45 the likelihood that you will develop type 2 diabetes increases greatly. This is, in part, because as you age you tend to exercise less, gain weight, and lose muscle mass. However, type 2 diabetes is also becoming more common among children. 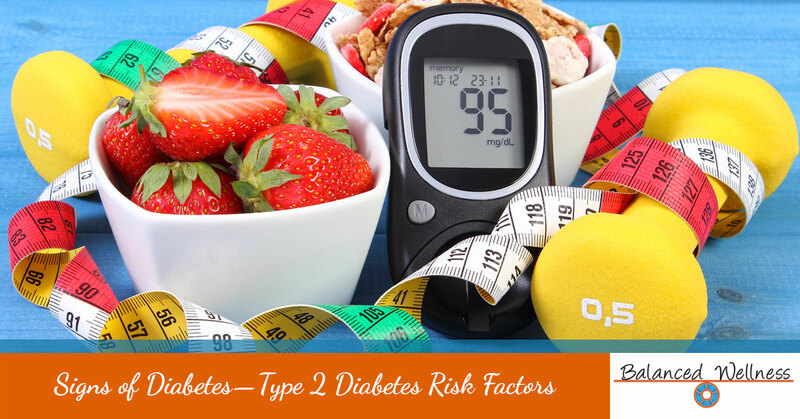 Being overweight or obese is a primary risk factor for developing type 2 diabetes. Fatty tissue—especially around the abdomen—makes your cells more resistant to insulin. Inactivity greatly increases your risk of type 2 diabetes. Exercise and activity not only helps control weight, but it also uses glucose as energy, making your cells more sensitive to insulin. The addition of a few minutes of daily physical activity can make all the difference—learn about our healthy diet plans and physical activity programs here. If a parent or sibling has developed type 2 diabetes, your risk of getting diabetes is significantly increased. However, diet and exercise can overcome this predisposition. The strength of your heart’s ability to pump blood around your body is your blood pressure. As a general rule, the higher your blood pressure, the higher your risk of health problems—this includes the risk of type 2 diabetes. Gestational diabetes is a type of diabetes that affects pregnant women over the age of 25, who are overweight and have a family history of diabetes. After being diagnosed with gestational diabetes you are more likely to develop type 2 diabetes. However, fewer than 1 in 4 women, who achieve their ideal body weight after birth, develop type 2 diabetes. Certain races and ethnicities are more susceptible to type 2 diabetes than others. Those more at risk include African Americans, Hispanic/Latino Americans, American Indians, Pacific Islanders, and some Asian Americans. As we mentioned in our recent Preventing Diabetes blog, type 2 diabetes can be prevented or delayed with very simple, yet proven-effective, lifestyle changes. These changes include losing weight if you are overweight, eating healthier, and making physical activity a regular part of your life. Though it is easy to say what needs to be done, implementing these changes into your daily life so that become a part of your routine can be a difficult thing to do. If you need help addressing your risk for diabetes, we can help! Our CDC-recognized wellness program is designed specifically for preventing diabetes. Learn more about our Prevent T2 Program here and don’t hesitate to contact us with any questions you might have. Think you might be at risk? Take the Type 2 Diabetes Risk Test created by the American Diabetes Association. For a more comprehensive look at type 2 diabetes, have a look at the CDC’s 2017 National Diabetes Statistics Report.